Sleep apnea treatment varies depending on the severity of the symptoms of this particular condition. When a person is suffering from a mild case, the doctor may choose a treatment for sleep apnea that consists of only lifestyle changes. Such lifestyle changes usually include losing weight for overweight or obese people or quitting bad habits such as alcohol consumption or smoking. In cases of patients who also suffer from nasal allergies, doctors will probably recommend that the patient treats those allergies too. 1.1 How to Cure Sleep Apnea? In cases where sleep apnea persists and the signs and symptoms simply do not improve with the lifestyle changes the doctor recommended, there are numerous other treatments for this condition. Still, there is no such thing as a sleep apnea cure. How to Cure Sleep Apnea? As we said, there is no definite cure for sleep apnea that works on all patients or can get rid of the condition right away. Still, there are many choices that answer the question on how to treat sleep apnea and we are about to discuss them here. There are various forms of oxygen available in order to aid people with central sleep apnea. ASV or adaptive servo-ventilator is a relatively new device that uses pressure to prevent breathing pauses and normalize the pressure. It works by first learning the breathing pattern in patients and store the information in its built-in computer. The remaining functions follow after this information is stored. 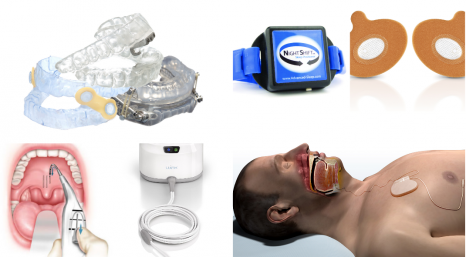 Being one of the most advanced devices for sleep apnea at the moment, this type of treatment is now known to be more successful than any other form of airway pressure, especially in cases of complex sleep apnea. One of the most popular therapies for sleep apnea is the continuous positive airway pressure or CPAP. This therapy is recommended for patients who suffer from moderate or severe sleep apnea. In such cases, a machine called CPAP is used with the aim of delivering air pressure that keeps the airway passages opened. This pressure is a reliable method in which the person is using a mask that is being placed over the nose and sends out pressure that will prevent both apnea and the symptoms of this condition, such as snoring. This is the most reliable method for treating the condition known so far, but comes with certain disadvantages. Many patients find using this machine while asleep to be uncomfortable and give up on using it. However, the majority of people gets used to the machine and adjusts the straps and tension in a way they find it comfortable for sleeping. Finding the best mask for sleeping is sometimes hard, so you may have to try out many before you make the best choice. Aside from the CPAP, some people have reported that they find a humidifier to be of big help. However, it is best to discuss this addition to your treatment with your doctor prior to using humidifier since some people experience problems with it. The doctor should help you make the best modifications that will make you comfortable in using the CPAP. If the airway pressure does not work and your sleep partner says you are still snoring during sleep, you should contact your doctor for a modification or change in treatment. Additionally, your machine settings may need some adjusting if you notice other symptoms such as for example, weight changes. Auto CPAP is another choice for treating sleep apnea, usually recommended to patients for which the CPAP presents a problem or does not show the wanted results. This is a different device type that works with airway pressure that will adjust automatically while the person is asleep. BiPAP are units that provide more pressure when the person inhales. They adjust in a way that less pressure goes when they exhale, which means they supply the patient with a bilevel positive airway pressure. EPAP of expiratory positive airway pressure is a single use device that people can place over their nostrils when going to sleep. We are speaking of small devices in the form of a valve, which allows the air to enter freely. However, when the person exhales, the air goes out through the valve’s small holes, which increases the pressure in the airway. When the pressure is increased, the airway is kept open. This particular device is known for its ability to reduce the snoring in people who suffer from a mild sleep apnea. People who hardly tolerate the CPAP can greatly benefit from this device. There are specially made oral appliances that can keep the throat opened. People find CPAP to be more effective than such appliances, so people who use this are those who found it hard to tolerate CPAP. Some of the oral appliances bring the jaw forwards and open the throat in this way. This is known to reduce or completely eliminate the snoring. Finding the best device for your therapy can be a struggle, but you can try out different options with the help of a sleep specialist. Once you manage to find the perfect fit, your doctor will teach you how to use it. You may need to visit their office repeatedly to adjust all settings with the purpose of reducing or eliminating the symptoms of sleep apnea. There are other medical problems that may be associated with sleep apnea. The possible causes of this condition include neuromuscular disorders, heart disorders and some hereditary features such as neck size etc. In such cases, people are recommended to treat the underlying medical problems in order to improve the symptoms of sleep apnea. Doctors rarely recommend surgery when the other treatments are working. However, there are cases where other treatments fail and the person needs another type of treatment. Before a surgery is considered, the doctor usually suggests a trial of a minimum of three months or some other treatment options. People who have problems with their jaw structure are usually recommended a surgery as their first option when SPAP does not work. In the procedure of jaw repositioning, the surgeons will move the jaw forwards from the other bones of the face, which enlarges the space between the soft palate and the tongue, therefore making it less likely for the person to experience airway obstruction. The surgical procedure is also known as maxillomandibular advancement. Tissue removal surgery or uvulopalatopharyngoplasty is done by removing the tissue from the top of the throat and the rear of the mouth. In most cases, surgeons also remove the adenoids and the tonsils in the patients. Many are against this procedure since it is less effective than the CPAP treatment and may not be a good treatment for sleep apnea since it may not completely stop the snoring and other symptoms. However, for people who cannot tolerate both the oral appliances and the CPAP devices, removing the tissues is the next best option. Surgeons can also implant plastic rods into the soft palate. This is usually done with only a local anesthetic. Tracheostomy is the process of making a new air passageway. The procedure is rarely done since it is only recommended to life-threatening cases of sleep apnea and cases where no other treatment option was successful in terms of relieving the symptoms. In this procedure, an opening is done in the neck of the patient and a plastic or metal tube is inserted in order to help the patient breathe. During the day, people do not need to keep the opening uncovered. However, they need to uncover it before going to sleep so that the air can pass in and out the lungs. Weight-loss surgery for obese and overweight patients to who this condition causes the sleep apnea symptoms. When the sleep apnea is not very severe, doctors can recommend lifestyle changes as the only treatment for the condition. In other cases, they may recommend a combination of a therapy or surgery and lifestyle changes. Excess weight is one of the most common causes of sleep apnea, which means that reducing some can help relieve the obstruction in the throat. In some cases of overweight or obese people, returning to a healthy weight has completely defeated the sleep apnea. However, if a person returns the weight afterwards, this condition can return, too. Regular exercise is very important for the health, regardless of the condition. However, exercise is also known to be extremely beneficial in the cases of sleep apnea, with patients reporting ease in symptoms without even trying out any other treatments. Sure, we are not speaking of all medications in general. Certain medications such as sleeping pills and tranquillizers can relax the muscles in the throat and cause sleep apnea symptoms. Sleeping on the back causes the soft palate and the tongue to rest against the throat’s back, which can block the airway and cause sleep apnea. If you are suffering from sleep apnea, you should change your sleeping position and start sleeping on the side or the abdomen. There are numerous treatments for sleep apnea. A consultation with the doctor and some tests can show the severity and cause of this condition, which will allow the doctor to make a diagnosis and set the proper treatment for the patient. The treatment option may not fit the patient, but one can try several options before finding the best fit.